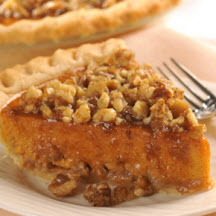 You will love the flavor and texture of this reduced calorie pumpkin pie with a crunchy candied topping. This excellent variation on a classic will be sure to impress your guests. Combine walnuts and SPLENDA® Brown Sugar Blend in small bowl. Place 3/4 cup of nut-sugar mixture on bottom of pie shell. Combine pumpkin, evaporated milk, SPLENDA® Sugar Blend for Baking, eggs, pumpkin pie spice and salt in medium bowl; mix well. Pour batter over nuts. *Or, 1/3 cup brown sugar, firmly press, may be used. **Or, 1/3 cup granulated sugar may be used. Nutritional Information Per Serving (1/8 of recipe): Calories 410; Calories from Fat 220; Fat 24g (sat 7g); Cholesterol 70mg; Sodium 300mg; Carbohydrates 38g; Fiber 4g; Sugars 23g; Protein 9g.